Achilles tendinitis effects all ages and activity levels - how do you know if you have it and how do you treat it? Achilles Tendinitis – What Does That Have To Do With Heel Pain? When patients come to the office and explain that they have heel pain, the majority of the time we assume it is from plantar fasciitis. Plantar fasciitis is the inflammation of the ligament at the bottom of the foot that goes from the heel, across the arch, and inserts in the ball of the foot. But heel pain can also mean pain in the back of the heel, not the bottom of the heel, and this could mean Achilles tendinitis. The Achilles tendon, also referred to as the heel chord, is a tendon that is actually made up of 2 muscles, the gastroc and the soleus muscles, combined they are commonly referred to as the calf muscle. The gastroc muscle originates in the upper part of the leg, while the soleus muscle originates just behind the knee, and they come together into one of the strongest tendons of the lower extremity. The tendon inserts into the back of the heel bone, or the calcaneus. Tendinitis, or inflammation of this tendon, causes pain in the back of the heel. This brings patients in to our office when they say they have heel pain, they are describing pain in the back of the heel. The tendon is actually named after the Greek god Achilles. It is legend that his mother held him by the heel and dipped him in the river Styx rendering him unable to be hurt or wounded, except in the area where she held him and was not dipped into the river. He was injured with an arrow in his heel, so therefore the statement “his Achilles heel” is equivalent to an area of weakness. In reality, the tendon is very strong and is the main tendon responsible for dorsiflexing and plantarflexing the ankle. It helps in stability of the leg and helps with pushoff during gait and running, and is responsible for the ability to jump and land in sports. How Did I Get An Inflammation Of This Tendon? 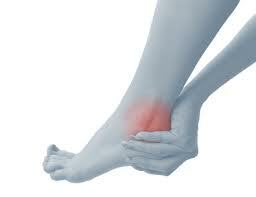 Achilles tendinitis is often due to an overuse injury. It can be from repetitive actions that put slight stress on the tendon, causing inflammation of the fibers that make up the tendon. This can be something like over training for a sport, overuse of the tendon due to lack of cross training, or starting a new sport that your boy is not used to. It can also be from every day occurrences, for example someone is used to wearing high heels, causing the shortening of the tendon. Then one day he or she decides to wear flats, and the tendon is stretched out when it is not used to being stretched. This can also occur in runners who are used to wearing running shoes with a higher heel counter, then move to a flatter or minimalist shoe, and the foot is not used to the Achilles tendon being stretched. Sometimes, we just don’t know the etiology or why it happens – but we can find ways to solve the problem and get you out of pain! -is there a concurrent heel spur? -are there any calcifications within the tendon? -what does my weight-bearing foot and bones look like, and is it contributing to the pain? After we rule out any bony involvement, we will do a thorough exam. We may do the Thompsons squeeze test to rule out a complete or partial rupture of the tendon, and palpate along the tendon course. We will determine if the pain is more insertional, or at the insertion of the tendon at the back of the heel, or if the pain is along the tendon itself of the muscle belly itself. Conservative treatment would include light stretching, immobilization and compression in either an unnas wrap (soft cast) or an ankle brace, or in severe cases, we may recommend a CAM walker (walking boot) because sometimes immobilization is the only way to get you out of pain and to start healing. If the doctor suspects a tear, she may order advanced testing such as an MRI or a diagnostic ultrasound. To decrease the pain, we recommend either an oral NSAID, or as an alternative, the MLS Laser therapy you can find in our office. As the pain is decreasing, our doctors will recommend a night splint. This durable medical equipment is only worn at night non-weigthbearing. It holds the stretch in the Achilles tendon (and bonus, it stretches the plantar fascia as well!) longer than you can hold it; it acts passively instead of actively. In addition, your doctor will introduce an icing and stretching regimen to increase flexibility and decrease the tightness that causes the pain. As an adjunct to the icing and stretching and laser treatments, your doctor may recommend physical therapy. Physical therapy is a great addition to the treatment regimen as the stretching that you or I may do is much different than what the therapist may be able to accomplish. Plus, going 2-3 times a week for 4-6 weeks ensures your progress and exercises along the way to keep your Achilles tendon flexible. How Can I Prevent It From Coming Back? At Prairie Path Foot And Ankle, we always want to keep our patients active! So we will work with you to get back to the activities that you love. One of the best ways is to change the biomechanics of the foot with custom orthotics. This is a custom made insert that typically fits into your gym shoe; you simply remove the current insole and replace it with a custom one. We will take a plaster mold of your feet; it is total contact to get the exact contours of your foot. This is sent to the lab with a prescription from our doctors to ensure that now your pain is gone, your foot should remain biomechanically sound so that the pain does not return! Once your body has healed or is in the process of healing from the Achilles tendon pain, this is the perfect solution. You will also probably need to continue with the daily stretches and exercises to prevent the tendon from tightening up and to prevent the pain from returning. Any questions about heel pain or your Achilles tendon can be answered by our doctors. Just make an appointment to be examined and our doctors will come up with a treatment plan that will solve your problem. Posted on 01/20/2019 Achilles tendinitis effects all ages and activity levels - how do you know if you have it and how do you treat it?